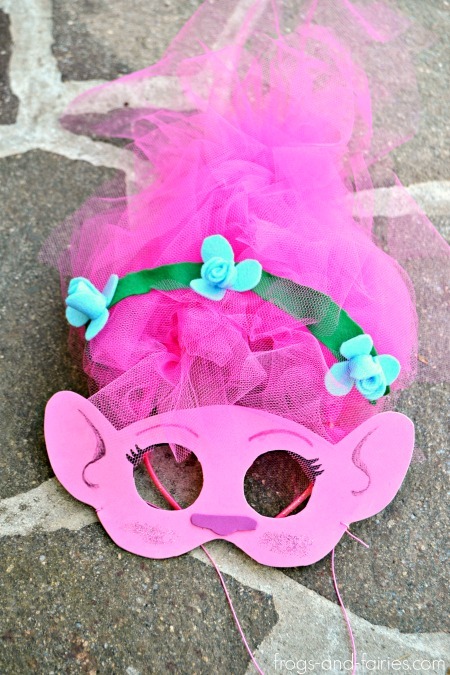 I’m thinking these masks would be a cute idea for a Trolls themed birthday party too! Or just a fun character play at home with kids! 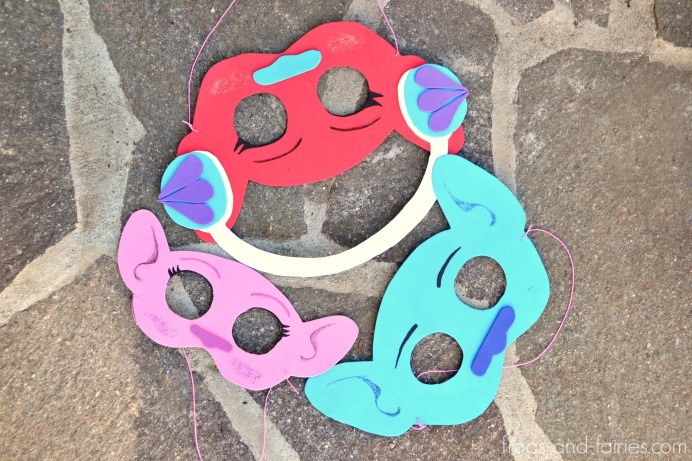 Here is how to make these fun masks of Poppy, Branch and DJ Suki characters from the ‘Trolls’ movie quick and easy + a free printable mask templates in child and adult sizes! 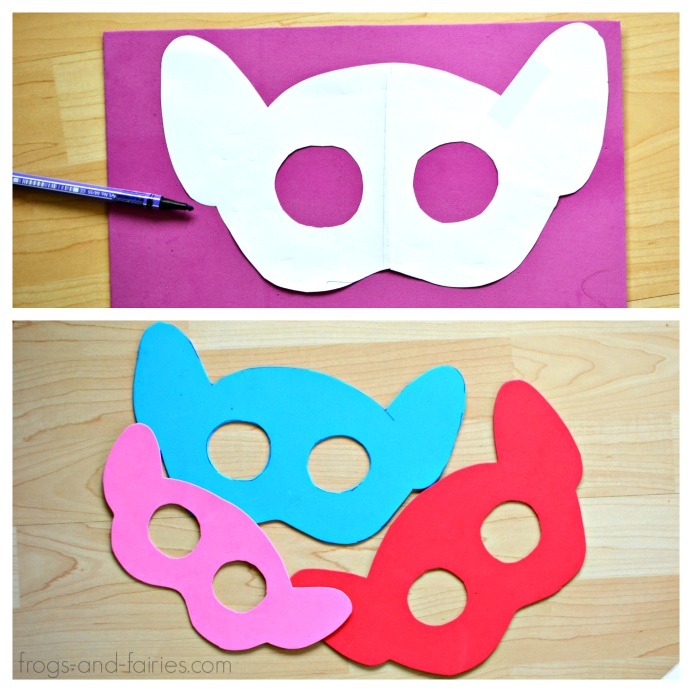 To make it super easy for you, I prepared a printable templates for child and adult size masks. Enter your email below to receive it and also subscribe for more fun ideas and free exclusive printables! 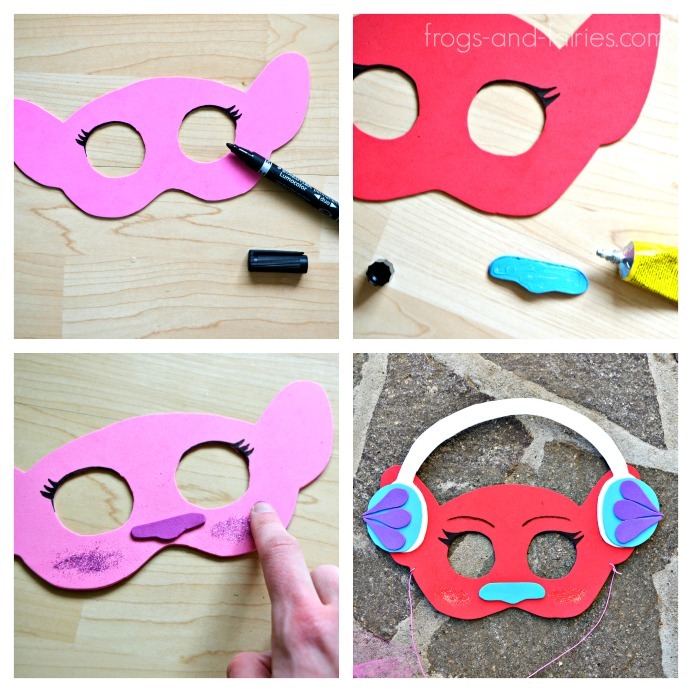 Print mask templates and cut along the lines, then trace template onto craft foam and cut out the mask. Add fun details! I used markers to draw lashes, brows and ears onto the mask and glued on a small piece for a nose. You can also apply a thin layer of glue and attach glitter for shimmery checks! 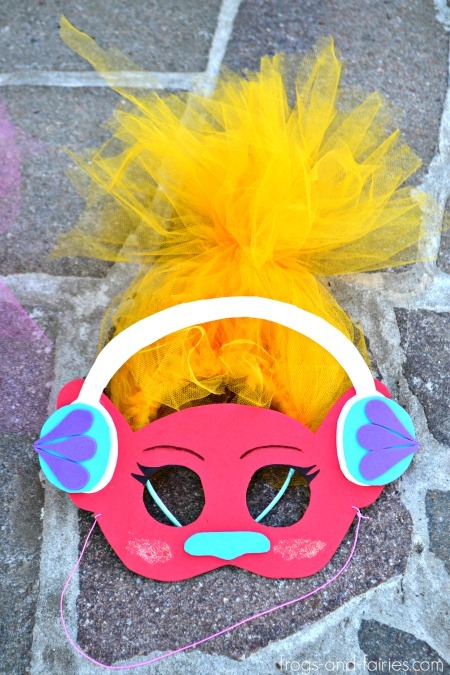 For a DJ Suki mask, I also cut some headphones! You can create different characters and add fun details of your choice! When the mask is dry, carefully make a small hole on each side using a toothpick and tie an elastic string. 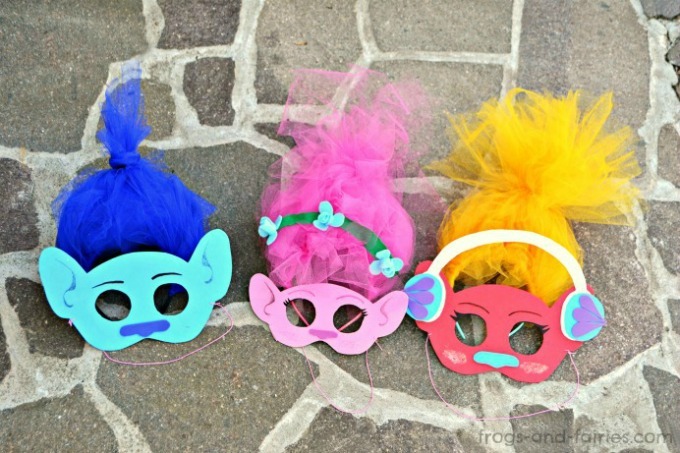 Of course, we also needed some trolls hair to complete the look! With help from this tutorial I created a Poppy, Branch and DJ Suki characters’s hair headbands. All you need is some tulle, string and a headband! Cut 15-20 strips tulle about 22 inches long. No need to be precise though. Fold the strips in half and loop them on the headband or just tie them onto the headband with double knot. Works either way! Repeat around the top of the headband until it’s as full as you want. Tie the edges wit a rubber band. Make sure not to tie it too high, so the tulle hair doesn’t flip down while wearing it. Poppy character has a signature flower hairband and fringe. Cut a few shorter strips of tulle and double knot them in between the other tulle hair to make it look like fringe! Cut a strip of thin green felt in a slightly rounded shape. Again, no need to be too precise, just eyeball it. 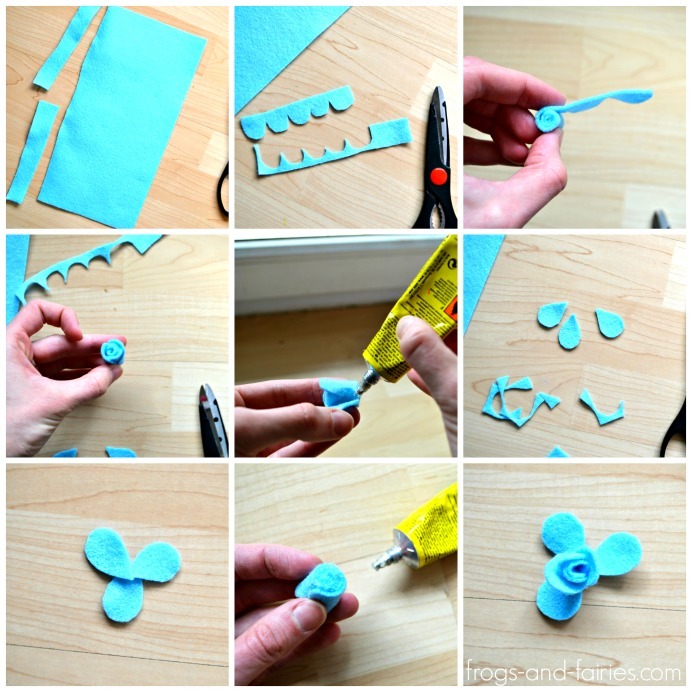 Make three blue felt flowers and glue them onto the hairband. Take a A4 sheet of a light blue felt and cut a strip along the longer side. Cut the strip in half. Take one half and cut five scallops. Trim off any excess. Take the other half and cut it into 3 petal shaped pieces. Roll the scalloped piece to form the center of a flower. Use liquid glue to glue it closed. Place a dab of glue to the bottom of the rolled bud and place it on top of the three petal pieces. Add a bit of glue to the bottom of each flower and glue it onto the green hairband. Done! Now you can look just like Poppy, Branch or DJ Suki character from the movie! 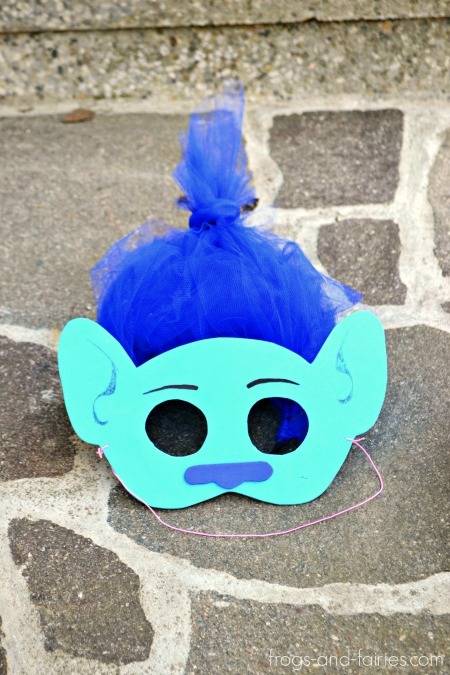 Or just add different details to a mask template to create your own troll look! Oh, and one more thing! 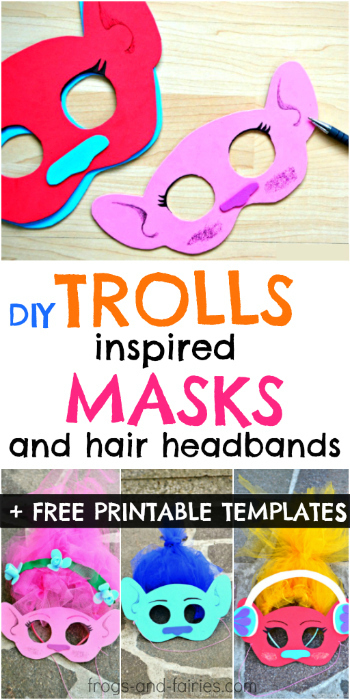 Our previous Trolls inspired post, Trolls inspired Pod Houses tutorial was featured on Allfreekidscrafts! Yey! It’s a lovely site with a lot of great projects. Check it out and I’m sure you’ll find a lot of fun ideas there too! 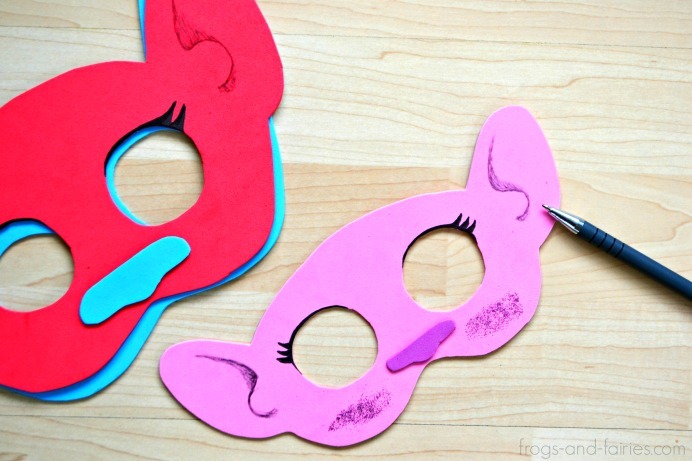 an adorable and so cheerful way to celebrate the carnival days I bet you’ve had tons of fun with this cute DIY! Thank you Damjana! It really was a super fun project! Hello Sandra… I love this mask … Are you able to still send the template for the poppy mask. Hello! Thank you! Please check you inbox and if you didn’t receive the link, let me know!